USING CTS SENTINEL LEAK TESTERS? USE THE DATA TOO. The QualityWorX CTS DataHub is your first step into data collection and analysis in the smart factory. 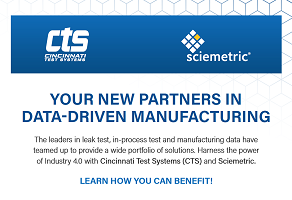 Start with your Cincinnati Test Systems Sentinel leak test, then find out how data can make a difference across the production line. 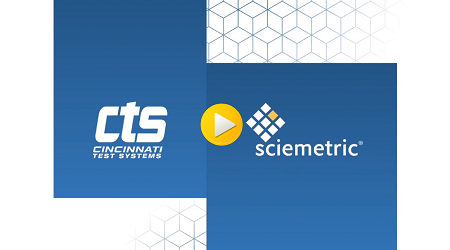 Cincinnati Test Systems and Sciemetric are bringing Industry 4.0 to leak and flow test by making it possible to collect, store and analyze data from CTS instruments using QualityWorX! The QualityWorX CTS DataHub allows you to pinpoint root cause of issues affecting your leak test, in minutes. It gives you complete traceability and proof of compliance when you need it. It helps you make continuous improvements to the test by analyzing the data and visualizing the impact of changes. One of the world’s largest automakers was struggling to resolve a bottleneck at their end-of-line CTS Sentinel I28 leak test stations. 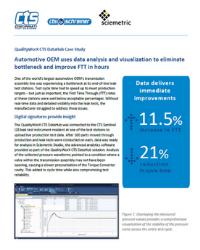 Find out how data – collected from the leak testers and analyzed with the QualityWorX CTS DataHub – armed them with the insight they needed to pinpoint the issue, reduce cycle time by 21%, and increase FTT by 11.5% in a matter of hours. READY TO GET STARTED WITH THE QUALITYWORX CTS DATAHUB? Curious about the difference data really makes? In this free e-book, learn how digital process signatures give you the insight you need to improve your leak test with better limit setting, greater repeatability, reduced cycle times, full traceability, and more. Why stop at leak test? Once you see the benefits of data analysis for improving part quality and enhancing productivity, you’ll want to extend this capability across the plant. Good news – you can! We can help you scale up to a QualityWorX Enterprise solution that lets you collect and analyze data from more instruments and more stations along the production line. You’ll be able to create a full part history while correlating all your data to learn why issues are occurring. From slow cycle times and unreliable test results to high warranty and recall costs – we’ve applied advanced data analysis over and over again to solve some of the biggest problems that plague manufacturing lines. Our “Ask the Experts” video series gives quick, practical answers to the challenges our customers bring to us every day. How can I use production data to minimize the cost and impact of a production recall? 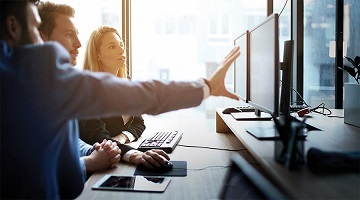 What are the key considerations for a data collection strategy in the connected factory? 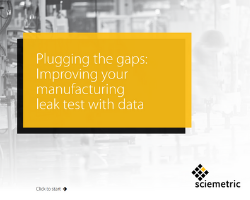 Sciemetric combines its expertise in large volume leak-testing – and in data management for traceability, test optimization, and root cause analysis – with CTS’s broad portfolio of flexible leak systems developed for a variety of customer requirements. Together, we are the partners of choice for virtually every major manufacturing vertical in need of a reliable and efficient leak test – from automotive and off-highway, to medical, consumer goods, HVAC, and military. has chosen the QualityWorX CTS DataHub as the 2018 New Product of the Year.